What’s the danger of I just want get it over with in divorce | Farias Family Law, P.C. What’s the danger of “I just want get it over with” in divorce? Maybe you feel guilty about the marriage failing; or the prospects of divorce are so scary that you want to put it behind you as quickly as possible; or you’re in a new relationship, and the sooner you get divorced, the sooner you can move on. The bottom line is that if you’re overly focused on finalizing your divorce as quickly as possible, you may be compromising your interests. Divorce can be painful. The sooner it’s done, the better, right? Well, that depends on what you’re getting and what you’re giving up as part of the divorce. No one wants to be involved in a divorce for longer than necessary. However, there’s a lot at stake in some divorces: money, assets, and time with your children, are among the most important issues addressed. Therefore, you’ll want to make sure that you’re not sacrificing too much in those other areas in your rush to finalize your case. How do I make sure I’m not hurting myself in my rush to finalize my case? - Did I make a sufficient effort through education and obtaining advice from a reliable attorney to have a reasonable expectation of what I may be entitled to in this divorce? This one’s pretty self-explanatory: if you don’t know what a fair outcome would be in your case, you’re proceeding with blinders on. There’s plenty of quality free information online. And if there’s a decent amount of money and/or time with your children on the line, you should consider investing in obtaining advice from a trusted divorce lawyer. - Once you figure out what you’d potentially be giving up, you should step back and objectively compare the loss you would suffer (financially, and in your relationship with your children if that’s an issue) to the benefit you’d derive from finalizing your divorce immediately. With the knowledge you’ve acquired through research and through a trusted lawyer, pretend you’re a third party hearing a story about the deal that you’re contemplating making in your case. Would you say to yourself “That seems like a good decision,” or “What are you insane!” or something in between? - Am I giving up because I’m scared of the process? 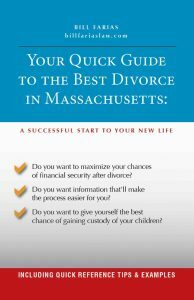 Divorce can seem scary: court dates, paying lawyers, etc. But sometimes, pursuing what you’re entitled to is not that painful or expensive. The primitive section of your brain frequently makes things seem worse than they really are - its job is to alarm you. This was useful when we were hunters and gatherers and had to worry about being eaten by tigers and bears. But now that life is a little easier, we actually have to make a conscious effort to keep that portion of the brain in check and recognize when it’s overreacting - which is unfortunately very often for some people. Ask a lawyer what you’d have to do to get what you deserve before throwing in the towel out of fear. - Am I rushing to finalize this because I’m feeling guilty about my failed marriage and want to compensate for that? Guilt is one of the main reasons people sign terrible and lopsided agreements in divorce. Party A either cheated on Party B or was a workaholic and didn’t devote enough time to the family, and now feels guilty about it, and irrationally wants to compensate for that by being too generous in divorce. If guilt is driving your decision, you may want to explore that issue (maybe with a mental health professional) before giving up the farm. - Am I rushing to finalize this because I’m in a new relationship and want to “move on” quickly? This is another common reason people rush toward divorce with no regard for their interests. If your new relationship is of any quality, your new mate will respect that you have to make sure your interests are protected during this difficult time. It may take a little longer to rid yourself of your ex, but if you’ll be much better off long-term, it may be worth the wait. Do you really want to sacrifice your financial future or time with your children just to quickly move on to another relationship, having just learned that relationships sometimes fail? Speed can be good in divorce. When you resolve a case efficiently and fairly, everyone’s better off. But when you feel like you’re rushing into a divorce and may be compromising your interests, make sure you step back and analyze objectively before rushing into a decision you’ll later regret.